ONCE UPON A TIME I built a cat enclosure. It was spacious and sturdy and stood within a massive rock wall at the bottom of my sloped hillside. Jake, my magnificent Border Collie/German Shepherd Dog, and Dickens, Pippen, Molly and Star, the litter of kittens he rescued when they were three weeks old, played in the enclosure for many years. They spent endless hours watching the birds, squirrels and chipmunks who lived in peace inches away on the outside of the screen. Time passed and one by one I said goodbye to my precious furry family. This past April saw the loss of Molly, the cat who had outlived them all. 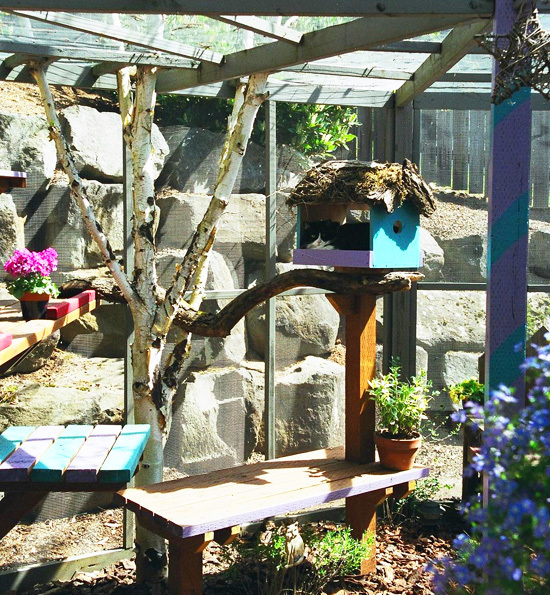 She was just a few weeks shy of her eighteenth birthday which meant the cat enclosure, built two years after she and her siblings arrived, had endured sixteen rainy Oregon winters—and they had taken their toll! The posts were rotting, the ramps were falling apart and the screen had pulled away from the wooden structure. The enclosure was beyond repair. It was time for it to be reborn as something that would celebrate the critters who had brought it to life. Handymen came to my yard and pulled the structure out of the ground leaving only the few pieces I wanted saved. I told them I’d be back in touch when a vision for something new emerged. Two months went by. On the evening of June 14th, the ten year anniversary of Jake’s passing, I filled a bowl with his ashes and those of the kitties he’d saved and sprinkled them on the dirt, seeding the ground of the former enclosure with the bones, fur and joyful hearts of the creatures who’d brought me so much happiness. They had accompanied me on my writing journey and inspired the five books I penned for animal lovers. With love, humility and tears I asked for guidance as I envisioned the next incarnation for this sacred space. The Universe answered my prayers…quickly! “Make this a magical place,” I heard, “filled with all the faraway lands you visited in books and the special friends who joined you along the way.” I knew who those special friends were: Clarity, my sword, and Esme, the dragon who came to me a few years ago when I took the greatest journey of my life. It led to the writing of my sixth book, Breathing Fire. I called the handymen back and asked them to build a corner pergola which gave the space much-needed structure. 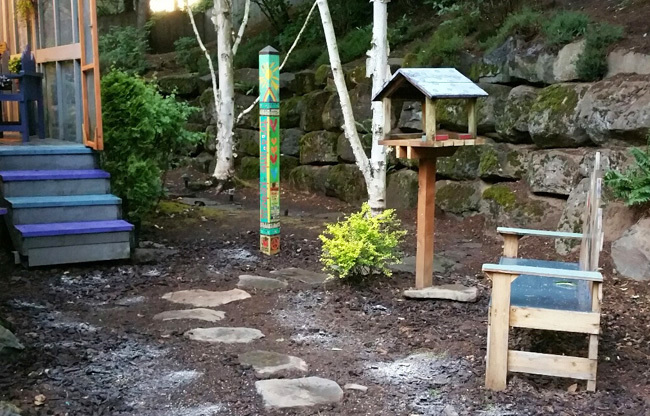 We rebuilt the stairs and brought in pots of Catmint and Salvia, plants loved by hummingbirds and butterflies. 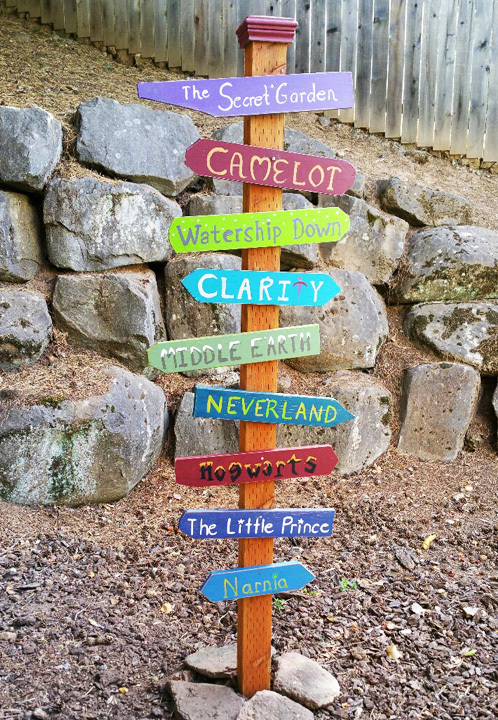 I’d always wanted to build a signpost and now was the time—a perfect way to feature all those faraway lands! I kept hearing those words. My dragon had told me her name a few months earlier after I’d found her flying around a store, her tail holding a sparkling glass globe. At her request she was mounted on one of the corners of the pergola where she could keep watch over the skies in case anything of consequence occurred. It’s odd that I never looked up the meaning of her name until I decided to write this post. Esme means esteemed and loved. My book, Breathing Fire, is about how a knight from a distant kingdom awakened me from a spell—the spell of unworthiness. Merriam-Webster Dictionary defines lair as the place where a wild animal sleeps, a place where someone hides or where someone goes to be alone and to feel safe or comfortable. I’d come through a difficult year health-wise shortly before I lost Molly. My travels through the land of misdiagnosis and the dark side of healthcare had left me adrift on murky waters and unable to find my way back. Molly’s unexpected departure was the beginning of my journey home, for my dearest feline friend carried my tears with her and released them beyond the sun and the moon so they could be reborn as starlight. I navigated by those stars as I began creating the garden. One day I realized that by tearing down something whose time had come to an end, and rebuilding something new and enchanting and filled with promise, I was rebuilding myself. 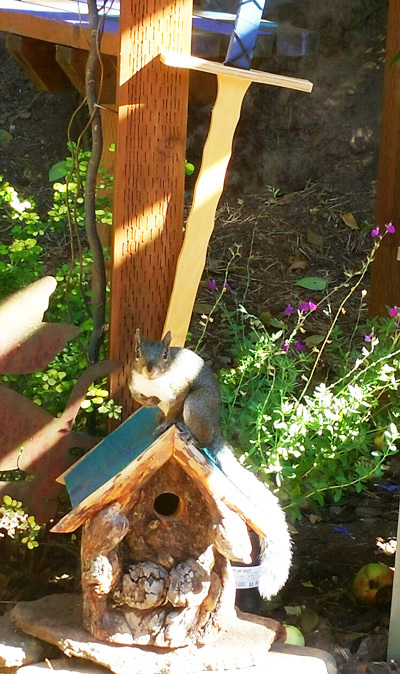 I sit on the steps and stare in wonder at my garden—a little bit of peace in an uncertain world. This magical creation came to life because of a collaboration between a benevolent Universe, many faithful furry friends, a fire-breathing dragon, a mystical sword finally come home, two handymen, a whole lot of people at Home Depot who followed my story…and me. Now that the walls are gone I watch the woodland creatures make their way down the stepping-stone path that winds through Esme’s Lair. Some rest on the steps, drifting off for an afternoon nap as they wait patiently for peanuts. They never have to wait long because the Chris Davis Café seems to always be open. And for those who are wondering I kept the back of my deck screened in—ready for the next feline friend who comes meowing at my door. 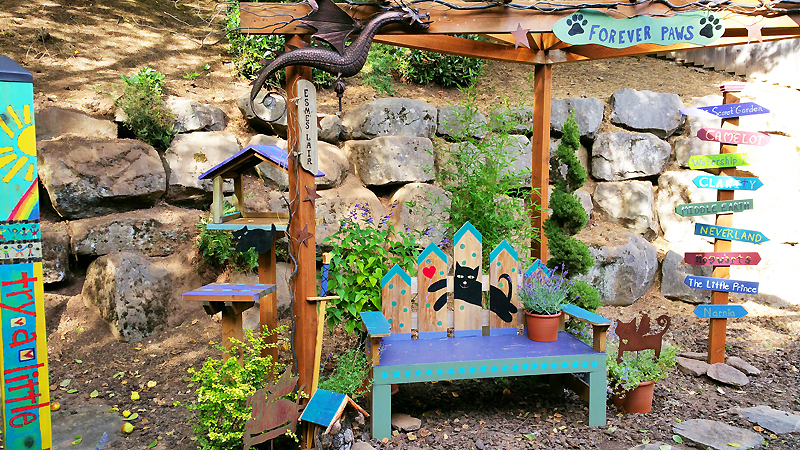 What a great tribute to your furry, furrever friends, Chris! I really enjoyed reading this and it brings wet eyes and a smile! And, I love that bench!! Thank you so much, Sally! Seeing this garden each day brings me peace. Josephine, thank you so much for your lovely words! It truly is my heaven on earth. Everything you touch is magical, Chris!!! How do you do it?! Connie, thank you so much! Creating this garden was a magical journey. I felt all my furry children (and one mighty dragon) with me every step of the way! Beautiful! Thanks for sharing your creation and your creative spirit! Thank you, Mary – I know you understand taking a journey of discovery! Chris, what an enchanting setting! I can feel the magic. Bob, I’m so glad you like the magical garden! It was a labor of love and a true joy to create. I’m not getting my blog notifications either – not sure why! So glad you like the magic garden, Layla. I had the plain wooden bench made to my specifications and then painted the artwork on by hand – no stencil. The signpost was so much fun to make. It’s my little secret magic garden! I write from South Africa. I have lost my FOREVER DOG last year and it is still very sad for me. I have been to Canada last year after her passing – KIMBA was her Name, a Little ShiTzu – and I found a bookshop on Vancouver Island with your MAGICAL BOOK ‘FOR EVERY DOG AN ANGEL’….Thank you for thinking and Feeling and writing the way you do. It is the most beautiful Book I have ever read in my life, and I am 70 years old. Please forgive this late reply to your message. 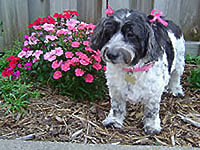 I’m so very sorry to hear about the loss of your beloved Forever Dog, Kimba. I can feel how deeply she was loved by you. I’m honored to know For Every Dog An Angel brought you some comfort. If you ever feel like sharing the pictures of your magical garden I would be honored to see them. I’m sending love and big hugs to you across the miles. Thank you so much for getting touch.